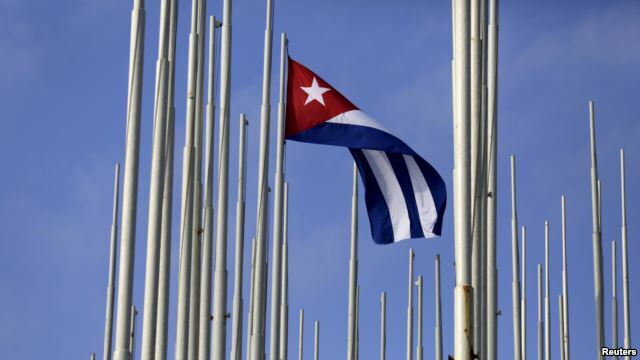 FILE – The Cuban flag flies in front of the U.S. Interests Section in Havana, May 22, 2015. STATE DEPARTMENT— The United States has dropped Cuba from its State Sponsor of Terrorism list but the removal does not clear Havana of all U.S. embargoes and statutory restrictions. The State Department announced Friday that Cuba had been removed from the blacklist – a designation that it shared with Iran, Syria and Sudan. But Cuba still faces U.S. restrictions on transactions such as exports and foreign trade because of other punitive measures that remain in place. “In addition to the State Sponsor of Terrorism designation, there is a web of restrictions and sanctions that have been applied over the years and some of them are unrelated to the State Sponsor of Terrorism designation,” said State Department spokesman Jeff Rathke. Among them, is the Helms-Burton Act, which includes an embargo and other financial restrictions. Cuba’s removal from the list is largely symbolic, said William LeoGrande, a Latin American politics professor at American University. “It is more symbolic than it is practical in the sense that most of the sanctions that fall upon a country that is on the terrorism list already apply to Cuba because of the broader embargo,” he said. But he said the removal was very important to Cuba, as Washington and Havana work to normalize relations. (Atlanta BlackStar) In her new book, former Secretary of State Hillary Rodham Clinton says she pushed President Barack Obama to lift or ease the decades-long U.S. embargo on Cuba because it was no longer useful to American interests or promoting change on the communist island. In excerpts of the book Hard Choices obtained by The Associated Press ahead of its release next week, Clinton writes that the embargo has given communist leaders Fidel and Raul Castro an excuse not to enact democratic reforms. And she says opposition from some in Congress to normalizing relations — “to keep Cuba in a deep freeze” — has hurt both the United States and the Cuban people. She says the 2009 arrest by Cuba of USAID contractor Alan Gross and Havana’s refusal to release him on humanitarian grounds is a “tragedy” for improving ties. “Since 1960, the United States had maintained an embargo against the island in hopes of squeezing Castro from power, but it only succeeded in giving him a foil to blame for Cuba’s economic woes,” she writes. She says her husband, former President Bill Clinton, tried to improve relations with Cuba in the 1990s, but the Castro government did not respond to the easing in some sanctions. 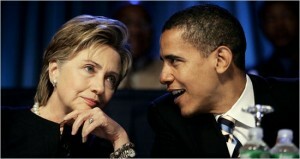 Nonetheless, Obama was determined to continue the effort, she writes. Clinton writes that in the face of “a stone wall” from the Castro regime, she and Obama decided to engage directly with the Cuban people. “We believed that the best way to bring change to Cuba would be to expose its people to the values, information and material comforts of the outside world,” she says. The steps that Obama took, including allowing more travel to the island and increasing the amount of money Cuban-Americans can send back to the island, have had a positive effect, she writes.